Earn $14.90 in Rewards credit (1490 points) What's This? Rotor's 130 BCD - Outer Non-Aero Q-Ring is a single outer chainring, CNC-machined of strong, rigid aluminum and paired with durable steel shifting pins. With 5 possible ring positions and 10% ovality, the Q-Ring adapts to each rider's pedaling style, optimizing their biomechanics for better performance. 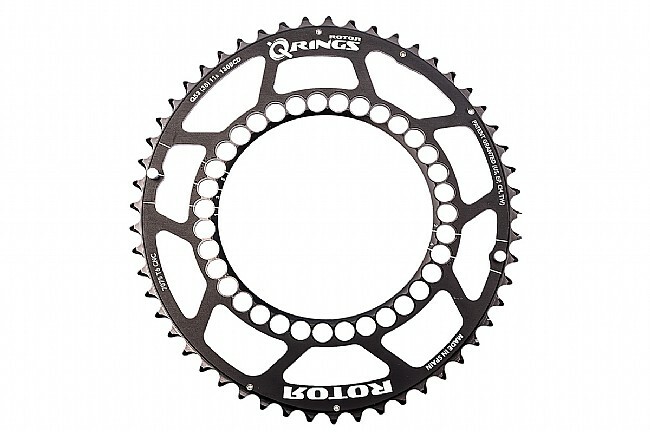 The 130 BCD Outer Non-Aero Q-Ring is compatible with standard 130BCD cranks and 9-11 speed groupsets. CNC-machined, 7075-T6 aluminum & steel shifting pins. Compatible with 9-11 speed groupsets. Weight: 181g per set (53A/39).